I always love it when the Bible refers to itself. Allusions, echoes, direct quotes, repetition–they all play major parts in the unity of the message of Scripture. These different methods of referentiality make for a tightly connected network of words, a web that delightfully entangles the reader as he is drawn further and further into the text. The Bible Is like Downtown Pittsburgh. 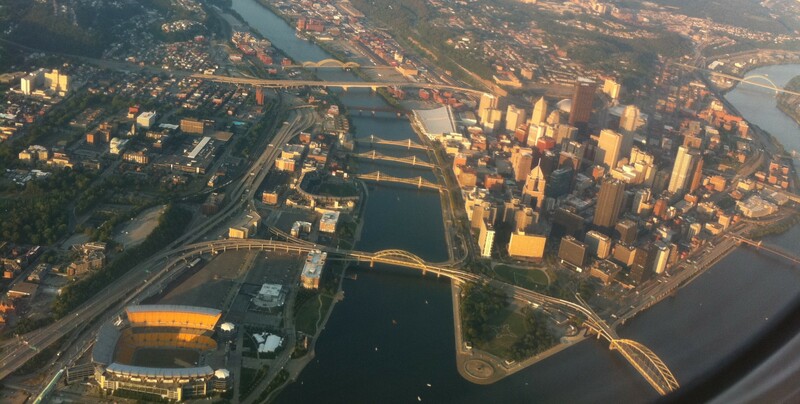 The Bible is constantly intersecting, over-passing, inter-looping, interlocking; it’s kind of like downtown Pittsburgh. [If you’ve ever driven through that city, you know exactly what I’m talking about.] It can be confusing, but once you get a knack for navigating the Scriptures and the way that the different books, chapters, and verses converse with one another, it can be quite rewarding. Each text has on-ramps, bridges, exit-ramps, underpasses, exciting skyscrapers, panoramic glimpses, and that claustrophobic feeling of too many things packed into too small a space. When I read a chapter of the Bible, I expect to see at least one other passage of Scripture at play. The writers of Scripture were also readers of Scripture. Their minds were shaped by the Word they had come to love so dearly. It is no wonder that those texts should flow in and through their writings on multiple levels intentionality. When you read Jeremiah, you should be recognize the influence of the Exodus narrative. When you read Judges, you should be interpreting the stories through the lens of Moses’ sermons in Deuteronomy. When you read John, you should be spotting developing motifs and internal referentiality. When you read 1 Peter, you should recognize that he is basically cutting and pasting entire chapters from the OT into his epistle. The nature of the OT makes it easy to make connections because it was written over the course of hundreds of years, giving ample opportunity for subsequent writers to ruminant on and fully digest the different books. In the New Testament, we are able to recognize the many ways the writers connect their story to the Old Testament. However, internal referentiality is more tricky to spot in the NT because, unlike the OT, it was written in a very short span. We are not certain of the chronological order of the books which limits our ability to determine who wrote what first. The brevity of many NT books indicates that the authors assumed a level of common knowledge they shared with their original audiences. By internal referentiality I mean instances where a passage of the NT references another NT passage either by quote, allusion, or echo. And count the patience of our Lord as salvation, just as our beloved brother Paul also wrote to you according to the wisdom given him, as he does in all his letters when he speaks in them of these matters. There are some things in them that are hard to understand, which the ignorant and unstable twist to their own destruction, as the do the other Scriptures. It is quite clear that Peter is familiar with Paul’s writings–familiar enough to commiserate with us that “there are some things in them that are hard to understand” [Thanks for the reassurance that we are not alone in thinking that, Peter!]. I love to think about the way the writers of the NT must have interacted with one another as they were writing their books, coming into contact with each other’s works, reading them, treasuring them as Scripture, and allowing them to shape the books that they were writing. I think of the four Gospels along with Acts as a kind of Pentateuch of the NT. The first five books of the OT shape the trajectory and language of the other thirty-four books. I believe the four-fold gospel account of Jesus’ life along with the narrative of the Church that grew as a result of His resurrection authority shapes the environment and climate of the rest of the books written in the NT. Some like to pit Paul against the Gospels, but I believe Paul himself was distinctly familiar with the narratives of Jesus’ life, and he assumes we as his readers are as well. Let’s consider an example. I, Paul, myself entreat you, by the meekness and gentleness of Christ–I who am humble when face to face with you, but bold toward you when I am away!–I beg of you that when I am present I may not have to show boldness with such confidence as I count on showing against some who suspect us of walking according to the flesh. Take my yoke upon you, and learn from me, for I am meek and humble at heart, and you will find rest for your souls. The same words πρᾷός (meek) and ταπεινὸς (humble) appear here in Matthew 11 that Paul uses when making his entreaty. In fact, Matthew’s gospel is the only gospel that attributes this characteristic of meekness to Jesus, a characteristic he shared with Moses I might add (See Numbers 12:3). The irony of Paul’s statement is witty because he assumes his audience is well acquainted with the meekness of Christ. More than that, I believe he assumes common knowledge of the above statement made by Jesus in Matthew 11. Come to me all who labor and are heavy laden, and I will give you rest. Take my yoke upon you, and learn from me, for I am gentle and humble in heart, and you will find rest for your souls. For my yoke is easy, and my burden is light. Paul is more subtle than say, Matthew. He is not one to speak so blatantly, “This was to fulfill what was written by [such and such]…” This does not mean Paul is unacquainted with other New Testament works. What other connections can you identify within the New Testament? There is an entire area of study dedicated to the obvious interdependence of the Synoptic gospels, but there is so much more to be discovered in the rest of the NT if we will devote time to searching. The beauty of Scripture demands it! Previous Post What Continuationism and Cessationism Are Not.